Usually present in sand, granite or sandstone, Silica is a natural mineral. It’s also found in other materials used for construction such as mortar or concrete. During the cutting, grinding or drilling process, the mineral is broken into fine dust which is referred to as silica dust. Although silica is the main component of most materials used for construction, there are a few that don’t contain the product or the content is very little. These compounds include limestone, cement and marble. There is a chance that these compounds could get mixed with those containing silica so in the end, the fine dust contains silica. During construction, wooden bars may be used for support for other users. The wood might either be used as softwood or hardwood depending on the type of construction. There are also wood-based compounds often used during the construction process. As such, when the wood is cut using saws, the wood dust is likely to cause harm to the construction workers if preventive measures are not in place. If you’re not properly protected when handling these types of dust, you need to know the type of damage they are likely to cause. There are many construction workers who have fallen ill due to lung cancer, silicosis, asthma or COPD (chronic obstructive pulmonary disease). For health risks such as silicosis, a form of lung disease, there is a chance that a few construction workers might experience the side effects later on. However, for those without proper protection, the symptoms set in when the contractor breathes in too much silica dust. When diagnosed at an advanced stage, silicosis is hard to treat but can be managed effectively. There are recent studies that have estimated that silica dust has resulted in the death of over 500 construction workers each year. Also, COPD has resulted in the death of 4000 construction workers every year. Anyone who works in construction falls into the risk category because of the concrete dust they breathe in when working. When using construction equipment that operate using high energy such as wall chasers, cut-off saws, grit blasters or grinders, which produce lots of concrete dust within the shortest time possible. When clearing the dust using dry sweeping rather than wet brushing or vacuuming, you’re likely to inhale more dust. Also, if you’re working in an enclosed construction space rather than an open air one, the concrete dust is trapped in the space forcing you to inhale it. If you take longer when handling concrete cutting tasks, you will inhale more dust than the people who work for shorter times. There are workplace regulations in place to prevent exposure to any dust during construction. Other than wearing protective clothing or equipment, there should be control measures in place to reduce the amount of dust. One of the most effective ways to do so is capturing the concrete dust at the source before it spreads into the air. Also, there are environmental regulations in place to prevent dust emissions or to control their contamination using the best possible means. Concrete cutting saws that are powered by compressed air or combustion engines might use wet systems to prevent further contamination of dust. However, it’s impractical to use these systems on electrical saws. Water is sprayed into the rotating disk used for cutting concrete to reduce emissions. Water can be supplied using a pressurised tank which is portable or from the water mains. Portable pressurised tanks are supplied by many manufacturers of concrete cutting saws. It’s a simple bottle (made out of polypropylene) that contains at least eight litres of water. Using a narrow tube, the bottle is attached to two jets on each side of the guard. To control the water supply, there is a valve attached to the container. When the construction worker pressurises the tank using his hand, the water is released. To guarantee dust suppression, the minimum rate of water flow should be about half a litre each minute. Therefore, rates lower than that will ultimately reduce overall performance. On the other hand, higher rates will not guarantee proper suppression of concrete dust rather the portable water tank will need to be refilled frequently. To maintain the proper rate of water flow, the portable tank should be pressurised regularly. This is the most preferable method since it’s flexible to carry around the site as long as there is a water source for any refills required. On the other hand, when using the water system from the mains, the water flows through the hose to the water jets to allow for dust suppression when cutting concrete. 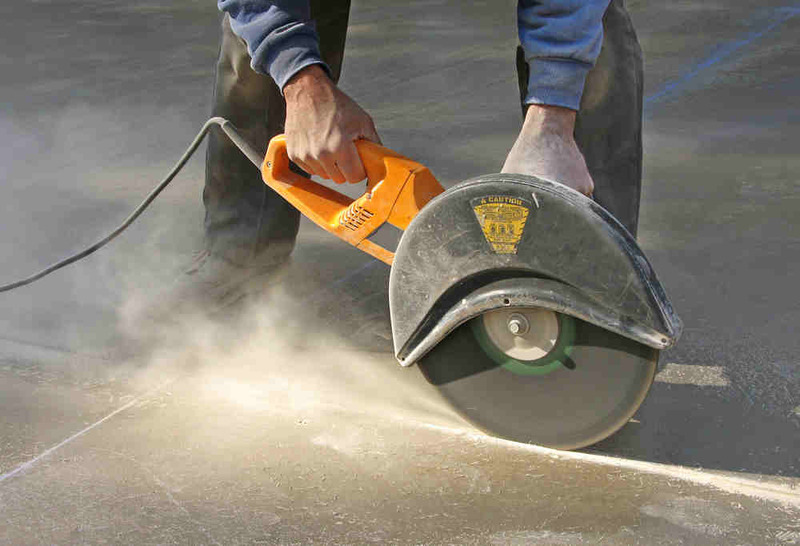 When using the wet systems or vacuuming to suppress the dust produced when cutting concrete, there are many things that can go wrong. Therefore, when this happens, it’s important to have some protective equipment such as masks to prevent further inhalation of dust. There are different types of masks for different tasks so it’s important to consult with your employer to get the best mask for the task in hand. There are many tasks that can produce too much dust which clogs the filter making it hard to breathe. A mask only protects the wearer alone. Other individuals at the construction site are at risk of inhaling dangerous dust. There is a chance that you might choose the wrong mask which means that you’re not completely protected. Therefore, regardless of whether you are wearing a mask or not, it’s important to include all the other protective measures to ensure you have the best chance of staying safe when working in this kind of environment.